The interior design industry is gradually changing the nautical world and challenging its current aesthetic codes. What yacht owners seek is uniqueness and distinction. The yacht expresses a social status and represents a “hide-away” place where one can re-create a family atmosphere by bringing objects, fabrics, colors, furniture and artwork into the space. The 70-meter long Talisman C1, created by Proteksan Turquoise, sails with GRAFF faucets. It’s the biggest yacht ever built by the Turkish shipyard; both the interior and exterior have been designed by the famous H2 London studio for a private owner. The yacht, currently used for private charters, features an “art deco” theme throughout all furnished areas. Beyond the spacious lounge and the fitness area are beautiful rooms designed to accommodate up to 12 guests. Two elements stand out for their originality: the spiral staircase, with a custom made chandelier hung over the entire height of the yacht and the sky lounge, with a 360-degree view. 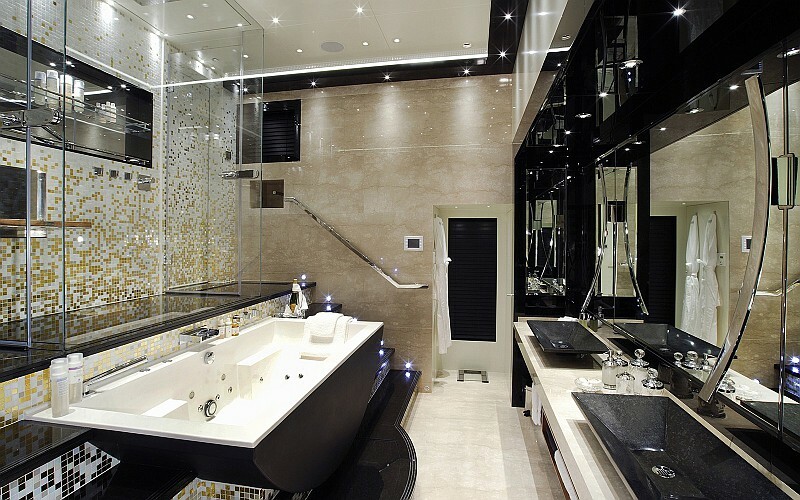 The bathrooms were designed to exude elegance and luxury. 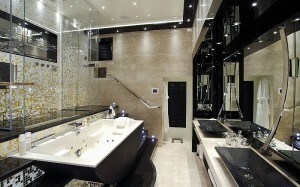 The steam room is used by the owner exclusively for his VIP guests. GRAFF faucets represent a further step towards the blending between the world of interior design and nautical style. GRAFF Luna has been chosen to decorate the yacht bathrooms for its capacity of re-creating on-board atmospheres with an urban contemporary look. “The inspiration of our faucet collection is based on the desire to convey the concept of quality artistic design,” says Emanuela Tavolini, Sales Director Europe for the American company. “In this respect, the search for innovative materials is fundamental. For any outdoor environment and especially for one as demanding as that of a yacht, where humidity and salinity are much higher than normal, it is necessary to use highly resistant materials. 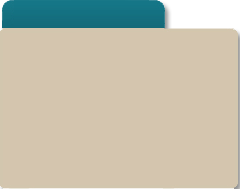 Ship owners select their favorite products from our collections and often require customized changes. ” Emanuela added further. For this reason, GRAFF has been able to participate in an interior design project in the nautical field. The strength of its manufacturing know-how is magnificently expressed in Luna’s technical and aesthetic details. Its sinuous elements, characterized by an ultra-resistant polished chrome finish, float gently on the wall: its spout’s curve generates an ethereal water flow inside the bathroom.